First of all, what is a futures contract? If I sell a contract, to deliver 1000 barrels of oil in December 2015, I have sold an oil futures contract. For example, I promise to supply a customer, let’s call him Harry Potter, with 1000 barrels of oil in December. Harry pays this December price to secure his supply and I lock in a comfortable price. Why would Harry do that? If the December futures price is currently $50 Harry probably believes that, come December, the real oil price will have changed. If it turns out to really be $70 (multiplied by 1000 barrels!) then Harry has won. He paid his supplier – me – much less then he would have paid if he had waited until December. $70 – the actual price of oil in December – is called the December “spot” price. On the other hand, if it turns out the December spot price falls to $45 then the supplier made the better deal. I wait until December to buy 1000 barrels of oil at $45 each. I supply these barrels to grumpy Harry who already paid me $5 more per barrel and rather thought he had made a good deal back in March. Oil future prices emerge because different players have different expectations about how oil prices will evolve. The oil futures market is currently in deep contango. What does this mean? Contango means traders expect the price of a barrel of oil to be higher in the future than it is today. Deep contango means this price will be a lot higher. Yet, as we just saw above, when delivery day arrives the spot market might tell another story. Oil storage facilities are near capacity in Europe and essentially full in the US. Storage is becoming inaccessible. Today’s spot prices are at a historic low. I might think they are likely to drop further, since producers cannot store oil to sell later and will be forced to dump their supplies somewhere. Many producers are becoming unprofitable. Investment in new oil production projects is being put on hold because prices around $40-$50/barrel are not enough to cover production costs. If there are few new projects to replace current production then oil supplies will eventually tighten and prices will increase. But not for at least a year or two. Identifying this lag is crucial. This means the contango will deepen. Based on the above predictions, I would expect the futures spread to widen. That is, the difference between the spot and future price of oil will get much bigger. [ii] Why? To reiterate: spot prices will decrease as we have a situation of oversupply that is likely worsen when oil storage facilities run out. Then the oil futures price will increase, relative to spot, since the market is not expected to tighten for one or two years. This pattern should hold for some months. Selling the futures spread means I sell a futures contract for a near month and buy a futures contract a far month. This will be profitable if I am right about the contango spread increasing. The spread is -$1 per contract. It is now April 2015 and I need to offset my position. The spread is now -$4 per contract. So I sold something at a higher price than I bought it back for. Profit! Selling the spread: short the near futures position and long the far futures position. Buying the spread: long the near futures position and short the far futures position. [i] Please be aware that this example is pure fiction and the author takes no responsibility for losses or gains made by anyone trading oil futures based on the above-described strategy. [ii] It does not really matter what the price level is per se. So it’s not helpful to say “prices will go up.” Relative to what? [iii] Short = sell, long = buy. These terms do not have anything to do with time-frames! Canada’s tar sands contain some of the biggest proven oil reserves in the world. They are mainly found in Alberta. But mining these tar sands, to produce ‘synthetic’ crude oil, is expensive. The process also releases more greenhouse gases than conventional oil production does. If we are serious about arresting climate change then these reserves need to stay in the ground. The bitumen part must be separated out and then upgraded into a synthetic crude oil (syncrude) before it can be further refined into petroleum products like gasoline and diesel. Two different production processes can be used to extract the bitumen from tar sands: open-pit mining, used when oil-sands deposits are close to the surface; and in-situ mining, used when oil deposits are deeper underground. Open-pit mining accounts for around half of all production. The process is destructive. First, forests must be cleared away. Then the tar sands are dug out, using enormous shovels, and they are then transported to processing facilities in trucks several storeys high. ‘Well-to-wheels’ life-cycle methodologies calculate the GHG emissions released in producing a petroleum product and getting it to the petrol pump. They don’t calculate emissions once you start driving. According to IHS CERA an Albertan tar-sands project releases between five and 15 per cent more GHG emissions from ‘well-to-wheels’ than does conventional oil production. The extra emissions come from two main sources: fuel input and ‘fugitive’ emissions. Fuels used in open mining projects include diesel, electricity and natural gas – for trucking and steam production, and for upgrading the oil to create syncrude. (Syncrude then has to be refined again to obtain the final-use fuel.) Around 20 per cent of all Canadian natural gas produced serves the tar-sands industry. Fugitive emissions are another problem. They stem from natural gas leakage, venting or flaring during mining. Venting is a process that releases any associated natural gas into the atmosphere; flaring burns off this unwanted by-product – because it’s not profitable to get it to a pipeline. Overall, the Canadian oil-sands industry generates emissions equivalent to Portugal’s – as a country. Portugal is ranked 56 out of 142 GHG-emitting countries worldwide. [ii] Open-pit mining also has the added effect of destroying Albertan boreal forest – a net carbon sink. All this makes Canadian tar sands development a significant net contributor to global climate change. Despite the emissions released during production, final-fuel combustion is ultimately more troubling. Emissions weigh heavily in the consumption phase, contributing 70 to 80 per cent of overall lifecycle emissions. The US is Canada’s primary export market for syncrude. It is transported by pipeline to specialised refineries mostly in America’s Midwest. Around three-quarters then becomes gasoline and a quarter is turned into diesel, feeding domestic markets. If all known oil reserves worldwide were extracted, produced and then used, climate change would occur on a dramatic, irreversible and dangerous scale. We have a lot of ‘unburnable carbon’. So we need to choose which sources, if any, we are going to develop. ‘Unburnable carbon’ refers to fossil fuels that can’t be burnt if the world it to limit carbon emissions so as not to trigger serious climate change. Most oil that is easily and commercially producible around the world therefore needs to remain in the ground. Tar-sands projects are among the world’s most expensive and marginal oil production projects – meaning that the cost of production is significantly higher than for conventional oil. In addition, tar-sands oil is only profitable when international oil prices are close to $100 per barrel. Canadian producers are already taking a hit. The International Energy Agency has estimated that a new Canadian oil sands project will cost up to 10 times that of a conventional project in the Middle East. Research by the Canadian government and the Pembina Institute shows that Canada’s manufacturing slowdown is partly the result of the Canadian dollar appreciating. This has risen over the past decade as exports, mostly of crude oil, have risen. Essentially, the development of Alberta’s oil sands is hampering the manufacturing growth. Continued reliance on commodity exports will divert investment away from the transition to a low-carbon economy. Being endowed with diverse natural resources, and having advanced manufacturing, service and innovation sectors, Canada has alternatives. Progress within more innovative and value-additive sectors is being overlooked, locking Canada into a high carbon-intensity development path. The impact of tar-sands development on global climate change, though alarming, is not the only reason to discourage such development. They are not only of questionable benefit to the Canadian economy overall but are unlikely to remain profitable in a low oil-price climate. Finally, as a significant GHG emitter, if Canadian politicians were to take a lead on climate change issues they could have a real political impact worldwide. Perhaps, the Canadian government and people could leave these particular hydrocarbons in the ground. Note: where unquoted statistics can be credited to the Pembina Institute. My last post explained why international oil prices have fallen dramatically during the last six months. 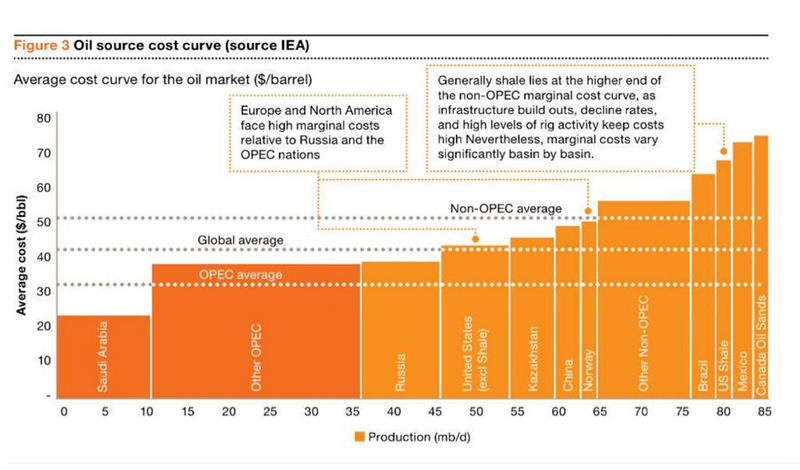 This has harmed the profitability of many oil producers. International oil traders and producing companies have called on the Organisation of Petroleum Exporting Countries (OPEC) to react to the fall in oil prices. Saudi Arabia is the biggest producing country within OPEC and often represents the group. But what can the Saudis do? For a long time Saudi Arabia was the world’s largest oil producer. The shale oil revolution changed this. Last year, we saw the US overtake both Saudi Arabia and Russia – the other big player – to become the world’s largest oil producer. Nevertheless, the US consumes a lot of what it produces. Saudi Arabia is still the world’s biggest exporter. Moreover, its vast reserves and production capacity allow it to “swing” supplies. That is, quickly alter the volume of oil it puts into the international market. In a nutshell, decreasing copious OPEC supplies would alleviate the international supply-glut and boost the international oil price. To do this OPEC must accept a decrease in total sales volumes and a smaller market share. The burden of cutting back volumes falls predominantly on Saudi Arabia as OPEC’s biggest producer. Saudi Arabia has had experience in the past with cutting supplies whilst other OPEC members “free ride.” Meaning they benefit from an increase in prices without decreasing their sales volumes as agreed. International producers are effectively asking Saudi Arabia to do them the same favour. Just why would it do so in a competitive market? The ultra-polluting Canadian tar sands projects are well out-of-the-money at oil prices of $50/barrel, since it costs $85 to produce a barrel of oil. The graph also shows us that Saudi Arabia can remain profitable close to $20/barrel. It could let current prices keep falling without sacrificing market share. Today’s oil price is less of a problem for Saudi Arabia than other countries where lifting costs are higher. Yet, it is unlikely Saudi Arabia will let prices fall that far. Profits from oil sales directly support the Saudi government’s budget. Also, higher prices eventually become more important than sales volumes as profit margins tighten. For example, if I sell ten barrels at $100 each this is the same as selling a hundred at $10 each. Except that if it cost me $9 to produce each barrel my total profit is $910 in the first scenario and only $100 in the second scenario. For now Saudi Arabia appears content to keep the price low and wait for US shale oil producers with thinning profit margins to leave the market. This strategy will cause the US shale oil revolution to lose pace and protect Saudi Arabia’s market share in the long term. However, we might see OPEC revise their policy later in 2015. It’s hard to measure exact output and countries report their own production volumes. I’ll write about the economic feasibility of the tar sands projects soon. Why is oil suddenly so cheap? Between 1998 and 2008 the price of oil increased ten-fold. Everyone was talking about peak oil – the idea that production would plateau and demand for oil would outstrip supply. Skyrocketing prices would force us to replace what we put in our cars. In 2008 prices broke the $100/barrel ceiling – and then kept climbing. What does it mean to say oil is $100 per barrel? When we talk about dollars we mean American dollars. Barrels are just a standard measure of volume (159 litres). The price of oil refers to a benchmark – a reference price. In the United States this is West Texas Intermediate (WTI), which is a blend of crude oils from diverse suppliers, which mingle at a physical hub in Cushing, Oklahoma. In Europe the benchmark is called Brent – a blend of North Sea produced crude oils. For a crude to become a benchmark there must be enough suppliers and enough barrels that the supply, and therefore the price, cannot be controlled by one player. Crude oil needs to be processed and refined to produce the more valuable products, such as gasoline or jet fuel, that industry and consumers can actually use. So it is refineries that buy crude oil from producers. However refiners don’t all buy WTI. There are many different varieties of crude oil. An oil producer will mark up or mark down their crude oil relative to a reference price. This is why we call WTI and Brent benchmarks. What determines this mark up or mark down? The quality of your oil. Oil can be light or heavy – a lighter, less viscous crude produces more of the more valuable petroleum products such as gasoline during the refining process. Oils are also classified as sweet or sour, which refers to the sulphur content. Sulphur is a pollutant which must be removed during refining. This is expensive to do. So the more sour your oil the more pricey the sulphur-removal process. However, if the international price of oil – the WTI benchmark – falls $10 then you lose your profit margin. A few years after WTI hit $100/barrel (and then went higher) it suddenly fell to $50. Multiply that by the millions of barrels being bought and sold and you can imagine there were some pretty big winners and losers. That’s the situation we have today. But why? 1. Since 2008 Europe underwent a recession which dampened demand for oil as economic growth dwindled and consumer spending dropped. 2. The United States is the world’s biggest oil consumer and used to drive global demand. However, over the past few years an energy revolution no one predicted took place in the US. As shale gas “frackers” began producing natural gas and pumping it into the regional pipeline networks, associated shale oil was also being produced. The best fields are called “wet” since they produce oil as well as gas, oil being more valuable. So within a few years the US went from being a huge importer to near self-sufficiency in crude oil production. 3. This meant that global oil markets were dramatically over-supplied. The supply glut happened because two of the biggest markets – Europe and the US – simply weren’t as hungry for crude oil anymore. These days we actually talk about peak demand for oil. Technology and extraction processes get better every year, so it’s likely we will be able to produce oil for many years to come. However, production will become more expensive and, as environmental pressures weigh in, oil will become pricey enough that consumers and governments look for replacements. Even if that means buying an electric car or investing heavily in public transport. Peak demand didn’t happen when prices skyrocketed in 2008. It might yet. Or it’s possible that demand for oil is dropping away. The international price will wane if other energy sources or energy efficiency measures become more competitive and attractive. We will have to wait and see if oil demand recovers in Europe or if Asia’s growth fills the gap.